Mr Koenders was the Dutch Minister of Foreign Affairs from October 2014 until October 2017. In the first half of 2016, the Netherlands held the Presidency of the Council of the European Union. Prior to this, from August 2011 to October 2014, Mr Koenders was Under-Secretary-General of the United Nations. From May 2013, he served as the head of the Multidimensional Integrated Stabilization Mission in Mali (MINUSMA). He was also the Secretary-General’s Special Representative and head of the UN Operation in Côte d’Ivoire in the period from August 2011 to July 2013. Between 2010 and 2011, Mr Koenders worked in South Korea as a negotiator on economics and development for the Organisation for Economic Co-operation and Development’s Busan Partnership agreement. 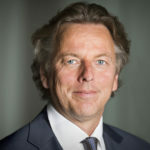 Mr Koenders held the post of Minister for Development Cooperation from February 2007 to February 2010. He was also Visiting Professor of Conflict Management at Johns Hopkins University (SAIS) in Bologna from 2000 to 2002. From November 1997 to February 2007 Mr Koenders was a member of the House of Representatives for the Labour Party (PvdA) serving as spokesperson on foreign affairs, human rights, trade, corporate social responsibility and international financial institutions. Prior to this, he was employed at the European Commission in the field of European foreign policy and, from 1993 to 1994, by the United Nations in Mozambique, Mexico and South Africa. He has also worked for the organisation Parliamentarians for Global Action. Mr Koenders was a member of the parliamentary inquiry committee on Srebrenica and was briefly President of the NATO Parliamentary Assembly from 2006 to 2007. He was co-founder of the Parliamentary Network on the World Bank and International Monetary Fund and served as its chair between 2000 and 2007.